Essentially, sporulation refers to the formation of spores from vegetative cells during unfavorable environmental conditions. As such, it may be described as an adaptive response that allows the organism to survive given adverse conditions (radiation, extreme heat or cold, lack of nutrition etc). Compared to vegetative cells, spores (formed during sporulation) are multilayered structures that tend to be dormant (or relatively dormant). These characteristics make it possible for some of the spores to preserve the genetic content of the organism during harsh environmental conditions. During certain unfavorable conditions (depending on the organism), some of the vegetative cells go through a series of morphological changes (and some level of programmed gene expression) that ultimately produce spores. Apart from genetic material, spores also contain some cytoplasm, specific acids, ribosome, and the appropriate enzymes among others that allow the spore to germinate during favorable environmental conditions. The term "spore" comes from the Greek word for Seed. Depending on the organism, spores vary significantly. A majority of spore-forming bacteria are Gram-negative bacilli (rod-shaped). These include aerobic Bacillus and anaerobic Clostridium species. Although some Gram-negative bacteria have been shown to be capable of producing spores, it is only a few species found in a few genera. 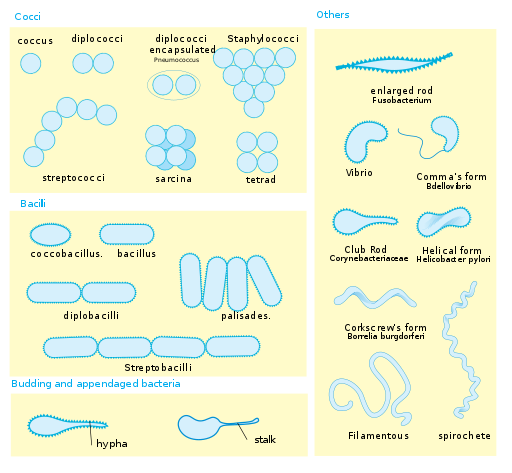 Depending on the type of bacteria, four types of spores are produced. Endospores: Endospores are the most common types of spores. They are typically produced by Clostridium (e.g. Clostridium botulinum), Bacillus (e.g. Bacillus anthracis) and Sporosarcina bacteria (e.g. Sporosarcina ureae). Myxospores: A myxospore is a type of spore that is produced by myxobacteria/ Myxobacterates (slimy molds bacteria). Referred to as resting cells in some books, myxospores are capable of surviving such harsh environmental conditions as UV light, high temperatures, and desiccation. They are formed within the fruiting body of the bacteria and in contrast to other resting cells; they are formed from specialized spore-bearing structures. Exospores: Exospores are a type of spore that are produced by members of the phylum Actinobacteria. These spores are produced through the budding of mycelium and can survive in harsh environmental conditions better than the vegetative cells. * Although spores play an important role in the life cycle of bacteria, they are not an obligatory stage. As such, they are typically common during unfavorable environmental conditions. * Sporulating bacteria are ubiquitous and can be found in soil, water, and air among other environments in nature. * Compared to the other types of spores, endospores are the most defensive structures capable of surviving harsher environmental conditions. This is largely due to the fact that beneath the thin and delicate exosporium, they have a spore coat that is made up of layers of proteins. Although unfavorable conditions such as diminishing sources of nutrition play an important role in sporulation, in that they trigger the process, sporulation does not necessarily start taking place right away. Rather, the bacteria will start by trying to move to an area with favorable conditions. For instance, in the event that food sources diminish, the bacteria, using such structures will attempt to move to a new location through such processes as chemotaxis. Other mechanisms to survive may involve an attempt to adapt to the new conditions or changing their mode of reproduction among others. Therefore, sporulation occurs as the last survival strategy. Before the cell commits to sporulation, several conditions must be met. * Here, Spo0A with a phosphyl group play an important role in regulating expression of about 121 genes some of which are involved in sporulation - High levels of Spo0A~P promote the process while low levels result in the formation of biofilm. Stage III: Engulfment - As the cell divides, 30 percent of the origin-proximal portion containing chromosome is covered. This is known as the forespore – A section of the cell containing chromosome is engulfed by a membrane as the peptidogycan is synthesized. Stage IV-V: Cortex and Coat assembly - Synthesis of the peptidoglycan cortex followed by formation of proteinaceous spore coat: In this stage, the spore (mature) is enclosed in two different layers that include the outer coat consisting of different types of proteins and the cortex that consists of a special type of peptidoglycan. Lysis of the mother cell - The mother cell undergoes lysis/disintegration. Some material from the mother cell may be used to build on the spore coat. Spore release - Mature spores are released into the environment and are capable of surviving high temperatures, certain chemicals that can destroy the vegetative cell and radiation among other extreme environments. 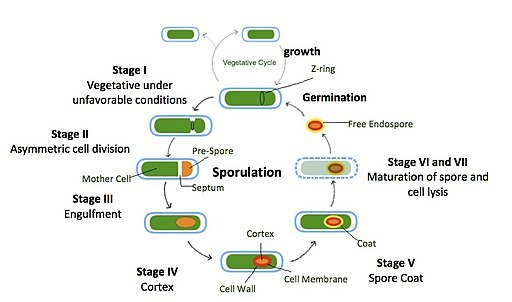 Once environmental conditions improve, the spore can germinate as the organism returns to the original vegetative growth. * Mutation has been shown to result in the production of twin endospores (two viable spores). Some mutations may also produce more than two endospores. Fungi are some of the most studied spore-producing organisms in the world. They produce a wide variety of spores that significantly vary in size, shape and other surface features that suit their environment (for dispersal etc). Whereas the spores produced sexually (through meiosis) remain dormant for survival (e.g. ascospores), those that are produced asexually (mitospores) are for dispersal. Produced through mitosis, asexual spores are released in high numbers and are genetically identical. This allows them to play an important role in reproduction when they land on the appropriate substrate in the environment following dispersal. * Chlamydospore - This is a type of fungal spore that develops from the hyphal structures during unfavorable conditions. Chlamydospores are characterized by a thick, melanized wall that protects the contents of the spore. Different types of fungi may produce different types of spores. · Zygomycota - Members of Zygomycota are known as zygomeycetes. They produce both sexual (zygospores) and asexual (sporangiospores) spores. · Ascomycota - Ascomycetes also produce both sexual (ascospores) and asexual (conidia) spores. · Basidiomycota - Compared to the other groups of fungi, basidiomyecetes are largely known to produce sexual spores that are known as basidiospores. As with bacteria (Gram-positive bacteria), fungi do not necessarily start forming spores when environmental conditions change. Rather, they attempt to adjust to the new conditions through a number of strategies. When nitrogen sources diminish, Saccharomyces cerevisiae may respond by going into a stationary phase or modifying their morphology. However, in the event that unfavorable conditions persist, spore formation becomes necessary. This involves a process known as meiosis. During unfavorable conditions, the organism responds by entering the early phase (first phase of sporulation) of sporulation. During this phase, cell division processes shift from the mitotic cycle in G1 (An interphase stage) and enter the S phase in meiosis. * This phase is therefore largely characterized by changes in the machinery of the cell cycle as well as altered RNA processing. The middle phase is characterized by various cytological events. Here, the meiotic process results in the production of haploid nuclei (four) that form four new daughter cells. This involves the modification of the spindle pole bodies to contribute to the formation of prospores (membrane compartments). * While given environments may contain various nutrients, the lack of nitrogen and other appropriate nutrient sources may trigger sporulation of species like A. nidulans and result in the growth of hyphae and consequently conidiation. * Before spores start forming, special reproductive hyphae known as sporangiophores are produced. * Compared to sexual reproduction, asexual reproduction is more common in fungi given that it allows for the rapid spread of the organisms. * Fungi spore vary in size and structure. The differences allow them to be effectively dispersed by a variety of agents including wind, animals, and water. For the most part, amoeba reproduces asexually through such processes as regeneration, binary fission, multiple fission, and sporulation/encystment. For the purposes of this article, we will focus on encystment and sporulation. When unfavorable environmental conditions (extreme cold, heat, starvation etc) such protozoa as amoeba ultimately respond by forming a protective cyst wall. * Such bacteria as E. coli, S. enterica and L. monocytogenes among a few others have been shown to survive extreme conditions when inside the cyst of such amoeba as A. castellanii. The cyst protects these organisms from various extreme conditions like high acidity, antibiotics, and insufficient nutrition among others. In the laboratory, encystation can be stimulated by using the non-nutrient medium. For instance, by using a non-nutrient agar that contains about 80 mm of sodium chloride, 15mM of magnesium chloride and 20mM of taurine, researchers have been able to stimulate encystment of A. culbertsoni. As the trophozoites transform into cysts, some of the morphological changes observed include reduced rates of motility, changing into a spherical shape, general cell shrinkage as well as gradual withdrawal of the pseudopodia (temporary cytoplasm-filled projection ). 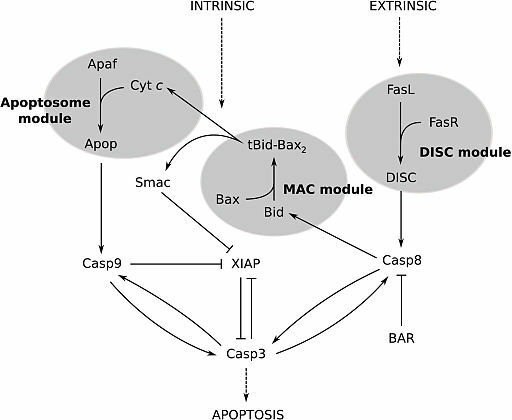 Various studies have shown cyclic AMP to play an important role in amoeba encystation. Here, amines of taurine or other biogenic amines bind to specific receptors on the organisms' membrane. This, in turn, activates adenylate cyclase on the membrane which triggers the encystation process. In addition to the morphological changes observed during encystation, a number of chemical and molecular changes are also evident. Sporulation in amoeba has been observed in social species like Dictyostelium discoideum. This process is unique and results in a mass of spores that are held up on a tapering stalk. During starvation, the amoeba cells come together to form aggregates that in turn elongate for form a migratory slug composed of over 100,000 cells. The slug then becomes upright as prestalk cells located at its tip form a cellulose tube. As cells enter the tube, they vacuolize in and contribute to its strength. From the desired substrate at the bottom of the stalk, prestalk cells climb and enter the stalk followed by the prespore. Once the stalk is complete, the prespore encapsulate and turn to dormant spores that are protected by a protein coat. * Here, it is worth noting that in the course of this process, the cells differentiate into pre-stalk and pre-spores involved in sporulation. * Cells that converge in large numbers are known as myxamoebae. * Once the slug is formed, it has to move to an area with favorable conditions (illuminated) where it transforms into a fruiting body. This is the stalk that is composed of the spore cells. * Vacuoles are created as prestalk cells form stalk cells. * Spores at the top of the stalk are released into the environment and dispersed to other environments. When environmental conditions are favorable in the new environment, the spores germinate to produce active amoeba. Esther R Angert. (2014). Sporulation in Bacteria: Beyond the Standard Model. ResearchGate. John, F. P. (1980). Spore Formation in Bacteria. Developmental Microbiology pp 88-114. Nand Kishore Gaur, Eugenie Dubnau, and Issar Smith. (1986). Characterization of a Cloned Bacillus subtilis Gene That Inhibits Sporulation in Multiple Copies. Journal of Bacteriology, Nov. 1986, p. 860-869. Thomas H. Adams, Jenny K. Wieser, and Jae-Hyuk Yu. (1998). Asexual Sporulation in Aspergillus nidulans. Microbiology and Molecular Biology Reviews, Mar. 1998, p. 35–54. Krishma, C. R. (1971). Encystment of Amoebae : An Example Of Single Cell Differentiation. Journal Article.